Jean N. Barnard (nee Newby) age 98, passed away peacefully at The Renaissance in Olmsted Falls on November 28, 2017. 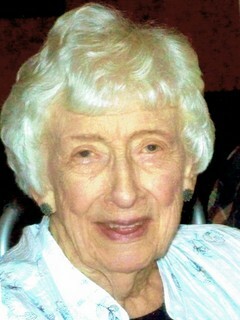 She was the beloved wife of the late Robert Barnard. She is survived by son Tom (Kathy) and daughter Judy; granddaughters Jennifer Barnard, Anne (Johnny) Shell, Laura (Keith) Hamilton; three great grandchildren; sister Carol Brediger and several nephews and nieces. Jean was born in Cleveland on June 25th, 1919. She attended Baldwin Wallace College where she was the National President of Beta Sigma Omicron sorority for two years. She was a teacher in the North Olmsted school system for 17 years where she retired as a Master Teacher and was recognized as a Jennings Scholar. A private service for the family is planned for a future date. Anyone wishing to be remembered to Jean’s family may make a donation to Westlake United Methodist Church in her name.